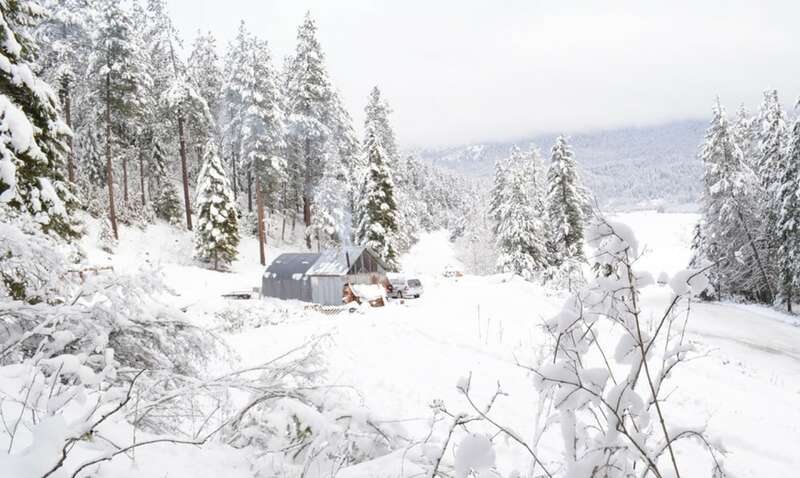 The cheap off-grid cabin sits in the beautiful, and cold, Pacific Northwest of the United States. It measures 10 ft x 12 ft.
Alyssa Craft and Jesse Stafford completed a cheap off-grid cabin-add-on to the trailer they are living in while setting up their homestead in the Western US. The cabin was built to allow them to heat the air around the trailer and prevent the plumbing, and themselves, from freezing during the snowy winter months. The majority of the building materials for the cabin are reclaimed from a demolition project and found by scouring the internet, thus the low cost. 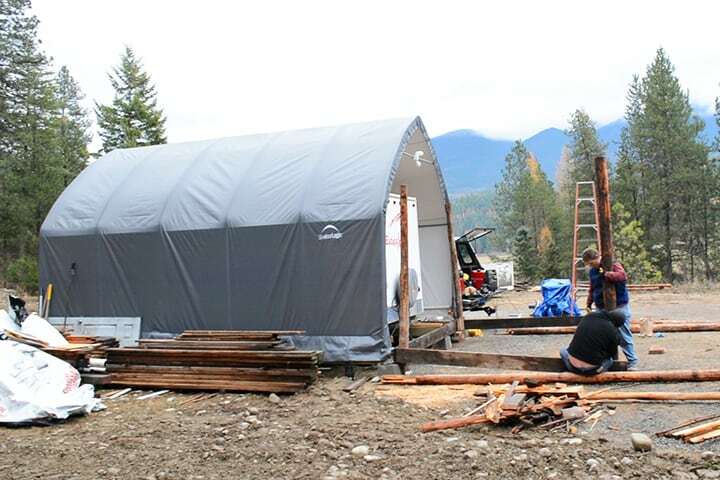 Alyssa and Jesse estimate that they actually used three thousand dollars worth of materials in building their cabin-add-on, but only outlaid $300 cash. Materials purchased included screws, the chimney, clear plastic roofing for the windows, and weather-stripping to seal the gaps between the reclaimed materials. The off-grid cabin is an extension of a car port used to shelter the couple’s travel trailer. 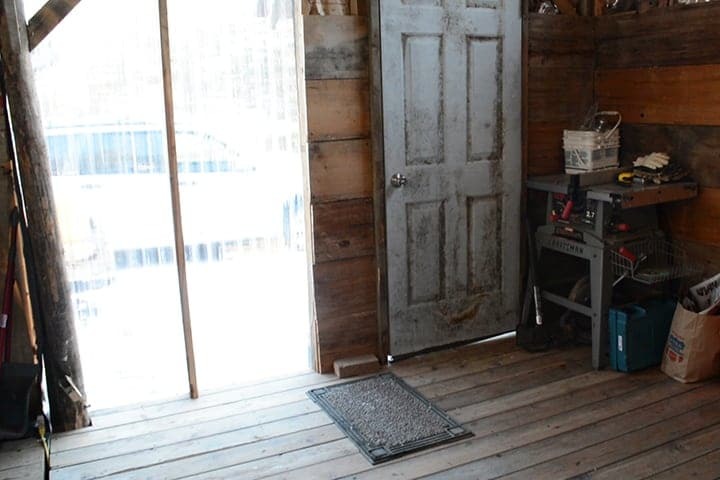 A wood stove was installed in the cabin, and this provides heat for the trailer and the cabin interior, which includes a hot water tank and water pump. The cabin is insulated, and clear plastic roofing panels were used in place of glass windows, as they fit the look the couple wanted better than the reclaimed glass windows they had. The cabin has reached a toasty 68 degrees even during the coldest winter days. The interior of the off-grid cabin includes a wood stove, water heater, and water pump. Alyssa and Jesse are striving for a true net zero lifestyle. They hope to grow their own food and live off the land as they raise a family together. Their intent is to have no need for money or the trappings that it brings, relying on nature and their own resourcefulness for all they need. Their future plans include building a homestead house for under $100,000, adding a septic system and well, and including solar power generation. 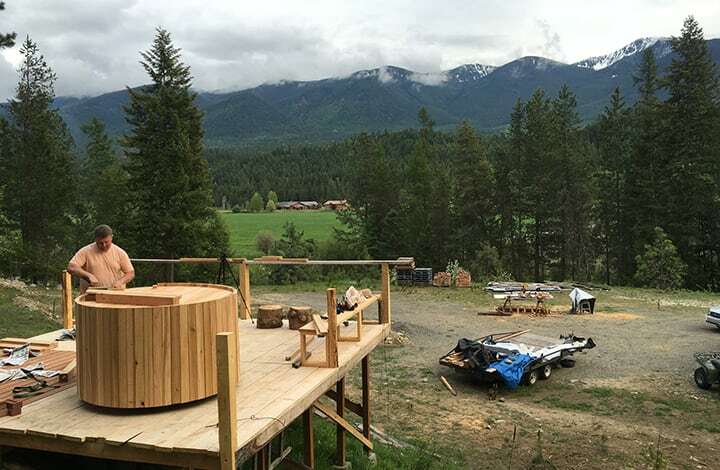 Lest you think it is all business, the couple has installed a wood-fired hot tub on the property so they can relax after a hard day of building. A wood-fired hot tub has been added to the property so the owners can relax after a hard day of homesteading. To follow their progress and learn more about homesteading, check out their blog.